Assumptions are often considered dysfunctional if they are inflexible, rigid, or lead to counterproductive behaviors. 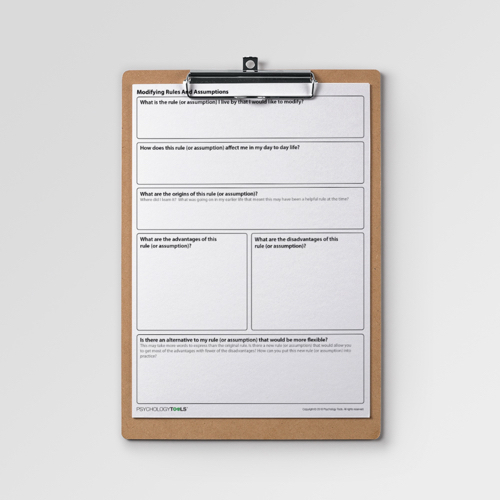 Modifying Rules And Assumptions is a CBT worksheet which can be used to explore the origins, advantages, and disadvantages of a rule or assumption. In cognitive behavioral therapy (CBT) assumptions are an intermediate stage of cognition between core beliefs (deepest level) and automatic thoughts (shallowest level). Assumptions sometimes, but not always, take the form of an “If … then …” statement. Assumptions are often considered dysfunctional if they are inflexible, rigid, or lead to counterproductive behaviors. 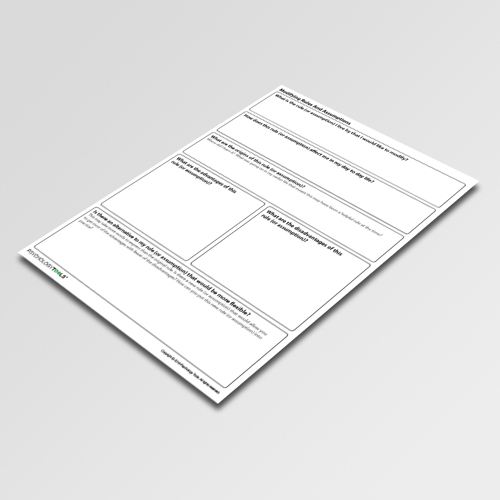 Modifying Rules And Assumptions is a worksheet which can be used to explore the origins, advantages, and disadvantages of a rule or assumption. It can be used to encourage a client to make adjustments and to generate a more flexible alternative rule which can then be tested. 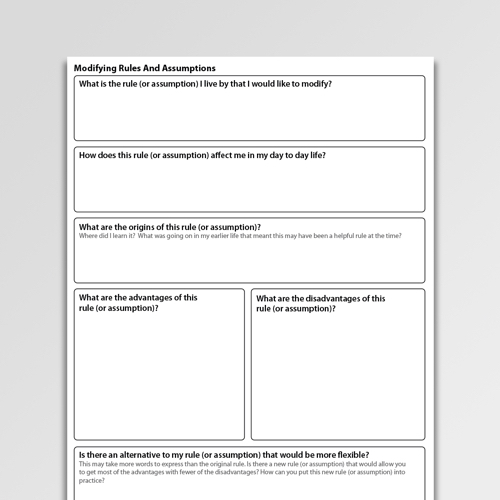 The Modifying Rules And Assumptions worksheet can be used to explore the origins, advantages, and disadvantages of a rule or assumption. It can be used to encourage a client to make adjustments and to generate a more flexible alternative rule which can then be tested.